The IRS and the Treasury Department are getting increasingly interested in U.S. citizens who maintain foreign bank, savings, and investment accounts. If you have any foreign investments, there’s an approaching reporting requirement that you should be aware of. 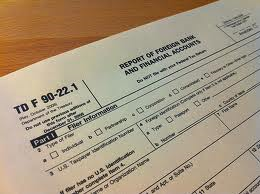 You are required to file “Treasury Department Form 90-22.1,” the “Report of Foreign Bank and Financial Accounts,” if you have a financial interest in or signature authority over a foreign financial account. These accounts include bank accounts, brokerage accounts, mutual funds, or other types of foreign financial accounts. This is not a form that you file with your tax return. Rather it is a separate form due June 30 each year that is filed with the Treasury Department in Detroit (due June 28 this year since June 30 is a Sunday). Generally, this report is required to be filed if you have an interest in such accounts, and the aggregate value of those accounts exceeds $10,000 at any time during the calendar year. If you do have assets in foreign banks or brokerages, be sure to meet your filing obligation. The requirements can get complicated, and the penalties for non-filing are severe. For details or filing assistance, contact our office.